Country Cuisine Collection is a bright sunshine kitchen fabric line. It was designed by Isabelle Biche who is well-known in the traditional embroidery segment of our creative world. She lives close to the Switzerland border and travels frequently across Europe and the USA for shows. She started designing quilts in 2002, and became a fabric designer for Henry Glass in 2016. Such an adorable bundle of joy! I would love to have it for my "stash". These prints are adorable! I can think of so many ideas I would use to decorate my kitchen with! I would love to win, thank you for hosting the giveaway! Fun collection for kitchen projects. Now if we could only sew instead of cooking. What fun prints to make some delightful kitchy items. Love this cheerful Country Cuisine collection! These colors and fabrics are so bright and cheerful! Perfect for kitchen bowl cozies, pot holders, placemats, and wall hangings. I'm in! Such fun prints are perfect for some placemats to brighten up the kitchen. this is such a cute fabric line. I think it would make for some very adorable place mats or maybe a cute table runner. Great collection. I can just imagine all the fun things I could make with it. I just love kitchen themed fabrics and these are some of the cutest I've seen! Cutest panel ever! Can't wait to see this in my local quilt store!!! The colors are a natural compliment for summer quilting. I can see place mats there as well. Love this fabric bundle. Would love to think of ways to use them! Love this sweet collection from the jars of jam, chickies, little hearts and strawberries! I would love to sew up some decorative kitchen towels and matching napkins! Thanks for this collection, it's just too cute. What a great collection for making hot pads, place mats, and kitchen towels. Thank you for the giveaway! Thanks for the fun and exciting collection bundle. So bright and cheerful. Cute fabric, would make a great gift quilt for an Auntie who is moving in to a new Condo. How cute are those chickens? I would definitely use this line of fabric to make kitchen items. I love the fabrics in this bundle. Thank you for the chance. What a cute bundle of fabric. Thank you for the chance to win. Beautiful fabrics! I would love to win this bundle and create something wonderful! What a fun bundle of fabric! Great for place mats and napkins! Cute fabrics, I like the daisy like flowers. What a cute bundle. This would make a sweet set of baskets. Super cute fabrics!!! I'd love to make some placemats with this bundle!! Really cute fabric. thanks for the giveaway. Such a cute bundle. Since my kitchen is red, yellow and chickens this is another must have bundle. I'll make a table topper out of it. Win or buy I gotta have it. What an adorable line. Thanks for adding new designers. It's so much fun to see what they create and for us to use it. Love the strawberries and the gingham checks! Awesome fabrics! LOOOOVE them all! Would be Super for things for my old farm house kitchen!! :) Thank you for chance to win some! Love the collection. It'll be perfect for new place mats and table runner. Thanks for the giveaway! Great prints, I see some small bags and other gifts for Christmas. These are very light and cheery fabrics. I could make so many things with these cute prints! This is an adorable kitchen set...would love to win this bundle! Awesome collection. Super cute Daisy's. Great to find a new designer. 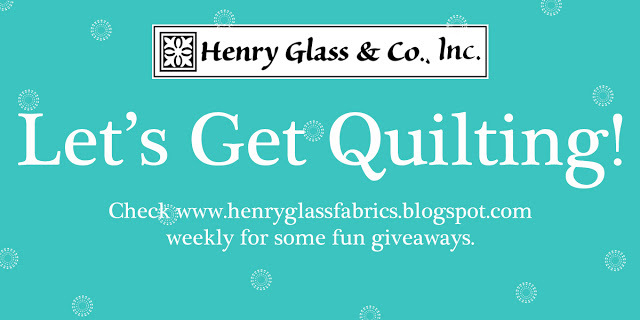 Thank you Henry Glass! These fabrics would be great for the microwave bowl cozies I have on my to-sew list. This fabric would be great for placemats and napkins. What perfect fabrics for a table runner and matching napkins! And I need to add some of those strawberries to my strawberry quilt. Thanks for the chance to win! Fun fabrics for pretty kitchen towels. What a fantastic bundle. Thanks for the chance to win.